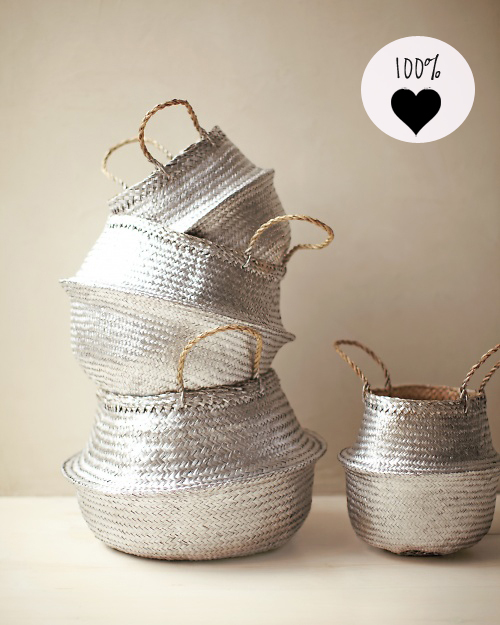 Today I’m loving … these silver baskets. These baskets make a great summer accessory but they also look great in your home. You can actually spray paint the baskets yourself. Instructions can be found here on Martha Stewart’s website. Wow, I love it, too. What a great Idea. These silver baskets look timeless and great! And I agree with Yna as these baskets are so durable and long-lasting, but you can get bored with the same brown tones. Another idea (and if time permitted) would be to spray-paint subtle designs on them – with stencils inspired by nature or filigree jewellery or Mediterranean tiles. These can then be carried over to other decorative items; the possibilities are endless. But I digress… It would be awhile before I got bored looking at these baskets; I’d most likely be reluctant to add to their already fabulous look! What a simply and beautiful idea. These silver baskets are just lovely.